In today’s competitive world, consumers are defining how companies structure their retail supply chain. They are demanding a more fulfilling experience from retailers and necessitating the need for options such as ordering online with in-store pickup and free returns across all channels. The explosion of mobile-driven shopping and the increasing popularity of no added cost returns only underscore the pressure that a retail supply chain faces. However, not every retail supply chain is efficient enough to meet fast-evolving consumer demands in a cost-effective way. They are creaking under the pressure of the new multichannel world. 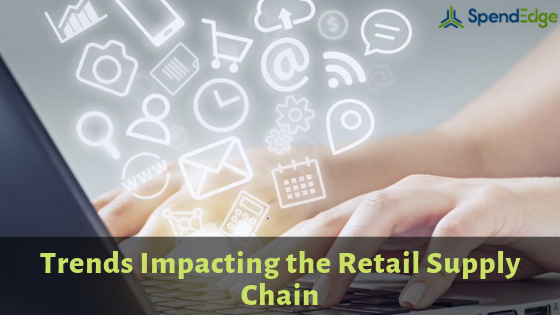 Also, a majority of companies possess a retail supply chain that is optimized for stores, and online channels are considered as a bolt-on separate business. This results in poor cross-channel coordination among fulfillment processes and increases the chances of out-of-stocks. At SpendEdge, we realize the impact that latest trends can have on the retail supply chain. Therefore, our team of experts has listed out the upcoming trends that can impact companies in the retail industry. Managing retail supplies can become an arduous task if not handled smartly. Request a free demo and know how our experts can help you improve retail supply chain management. Majority of millennial buyers, nowadays, prefer to research a product online before visiting any store. They compare prices and see if they can avail any digital discounts or coupons. Many times, they even opt to buy online but pick up in-store “to avoid shipping fees.” This creates opportunities for retailers to harness both the in-store mobile phone-toting shoppers and ones coming to stores. Retailers willing to enhance direct-to-consumer value proposition are constantly working to reduce delivery lead time and offer a larger assortment. They deploy varied stock-keeping units (SKUs) to fulfillment centers and activate each picking warehouses to offer next day delivery to their customers. Big data is a major trend in the retail supply chain, as the need to seamlessly share data back and forth with customers has increased exponentially. It allows real-time location tracking apart from real-time traffic updates and makes it possible for retailers to optimize delivery windows. Moreover, it helps companies to make crucial decisions and track inventory effectively. Want to know how integrated technologies can revamp an outdated retail supply chain and ensure the timely delivery of retail supplies? Although, it applies for all industries, the retail supply chain needs them the most. Companies in the retail industry are always striving to improve picking times. The situation becomes worse during the seasonal peak periods. With companies adopting collaborative robots, companies can accommodate seasonal demands and return them after the requirements are met. As consumers continue to shift from “things” to “experiences”, the impulse to rent will grow substantially. The retail supply chain that can adapt to these changes will witness long-term success as consumers will be spending more on offering better experiences. Moreover, embracing trends such as self-service stations will reduce the burden on shoppers of cumbersome tracking and shipping costs. Integrating retail and the “sharing” economy can impact the sale of retail supplies. Get in touch with our experts and know how an efficient retail supply chain can help manage it.